Soroptimist is a global volunteer organization with a network of over 75,000 club members in 122 countries. Soroptimists contribute time and financial support to community–based and international projects that benefit women and girls. Soroptimist International consists of four federations, including Soroptimist International of the Americas, of which Soroptimist International of Lodi is a member. The name, Soroptimist, means "best for women," and that's what the organization strives to achieve. Soroptimists are women at their best, working to help other women to be their best. Soroptimist International of Lodi (SI Lodi) was chartered in 1945. 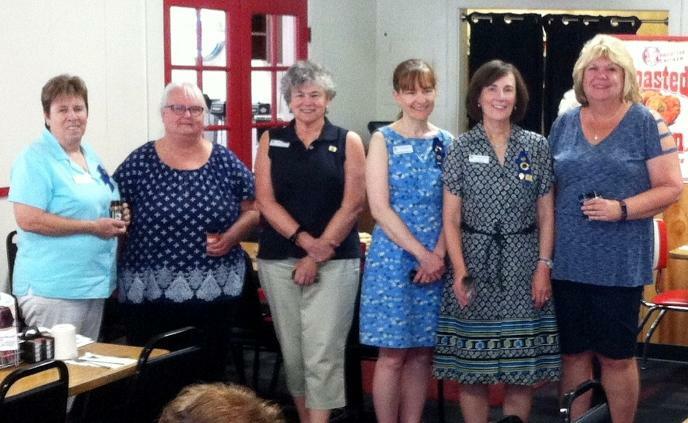 A second club, Soroptimist International of Lodi Sunrise, was chartered in 1989. In September, 2014, the two clubs became one under the SI Lodi charter. Our club meets at 6:30 PM on the 2nd and 4th Thursdays of the month at Richmaid Restaurant, 100 S. Cherokee Lane, Lodi, California. Si Lodi is in the Sierra Pacific Region of California, which ranges from San Francisco to Taft and from Los Banos to Mariposa. The Sierra Pacific Region has 3 districts, each district with its own director who serves on the region’s board of directors. Currently, the main focus of SI Lodi is on two programs: Dream It, Be It and Live Your Dream. Through Dream It, Be It, Soroptimist clubs provide girls with guidance, training and resources that will prepare them for career success. The Live Your Dream Award, Soroptimist's signature program, assists women who serve as the primary wage earners for their families and seek financial assistance to improve their education, skills and employment prospects. Additionally, we award a scholarship to a woman in the Mary Graham Foundation. These women have been in the foster care system and are no longer eligible for support. SI Lodi has also given donations in recent years to Hope Harbor Shelter for Women and Children, Lodi House, and the Second Step and Family Ties organizations. We also provided financial support to The Sisterhood, a program for middle and high school girls. Financial contributions from our members and the public help us continue to support programs which improve the lives of women and girls. We have periodic fundraisers, in which all are welcome to participate. We're currently selling $5 raffle tickets for a Cole Haan tote bag which is valued at $400. Only 150 tickets will be sold; the drawing will be held May 23, 2019 and the winner will be contacted. Please click below and send us an email if you'd like to request tickets. Visit our Facebook page by clicking on the link below. Once there, please share our postings with your Facebook friends. Barbara Warburton conducted the Olympic themed installation ceremony. The Olympics themed installation script and gold medals were prepared by Beverly Lacy. During the meeting donations were presented by Vice President Lise Bachman- Karnes. SI Lodi donated $500 to Suzanne Yip Schultz of San Joaquin County Family Justice Center for the benefit of victims of human trafficking and domestic violence. A donation of $100 was also presented to Beth Foxof World of Wonders Science Museum. Co-Presidents Marcia and Liz, Vice Pres. Deb, Co-treasurers Judy and Lynn, Secretary Jerri, Director Maxine, Corresponding Secretary Dorothea. Director Germaine was absent.